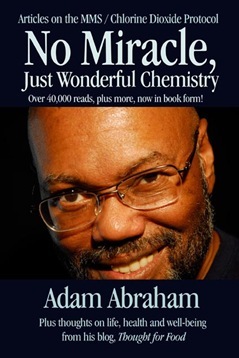 I am considering taking a selection of my MMS articles published here, starting with No Miracle, Just Wonderful Chemistry (which is the only place you can find them presently), and publishing them as a book. This will make it much easier to share this information with others. I have mentioned this to Jim Humble, who thinks it’s a fabulous idea. At this moment almost 35,000 people have read that particular article, which has become the de facto read for anyone who wants to get the gist of what MMS is about before, or after reading Jim Humble’s book. At the current reading rate, over 40,000 people will have read it by the time the book is available. So I dropped the “MMS”… the banner above the title tells the reader what it’s about. I also feel that many of the questions and answers that have been exchanged here (on this blog), between readers and myself, and other subscribers to this blog, and some of their stories of success, will be most helpful. 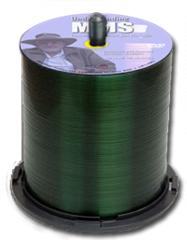 For many, the efficacy of MMS is no longer a question. It’s now a matter of how to best use it for whatever one’s situation may happen to be. That is a very personal discovery that each will have to make. However, this book can be a great resource, not only of instruction, but inspiration and encouragement. Encouragement is very important. Reassurance that we’re doing the right thing during those moments of toxin release when it’s hard to imagine what could be “right” about what’s happening. I’ve not yet determined how many articles will be included, which will determine the page count. The book’s trim size will be 6 x 9 in. If you have any suggestions or requests for this book, or are interested in ordering, please feel free to contact me. Needless to say, with the addition of this book on MMS, I can also package it with the DVD. In response to an inquiry from a viewer after watching it, who was moved by its message and delivery, and wants to buy in quantity to give to others, I have also made a change to the way that my DVD will be offered. 100 discs ($400 / $4.00 ea. First shipments for orders placed now will be the week of June 9. The initial manufacturing order of 1,000 units has been placed, and half of them are already committed. Another customer told me today (after placing his second 10 DVD order), not to discount the importance of the retail packaging. This is after I told him of the spindle option, so that he can choose what’s best for him. He said that the retail packaging, with the case, shrink wrap, and all, along with the production values of the program itself, convey a sense of the producer’s regard for the subject matter. I can speak to that regard. It’s that important. It’s also important to make the information available to everyone in every way possible. So it’s not either/or, but both. The spindles won’t negate the retail package. The retail package will open doors for the spindles. Well, that’s the way I see it. Great idea. This should make the wonderful info you have much more accessible to a wider audience. One suggestion re the book cover. I am coming from a background in marketing. Think about someone seeing just the title and cover. What associations does the cover invoke? Will it compel the person to pick up the book and read the testimonials and summary on the back? I propose using some nature imagery on the cover. It has the widest appeal and invokes associations of wholesomeness and goodness. (Ever notice how many drug ads on TV show nature, children, family?). Just a thought. I think you’ll find a wider appeal with a nature image or a neutral patter with striking fonts. I look forward to ordering the book when it comes out. BTW, a combo package of book + DVD is a great idea. I’m all for it. 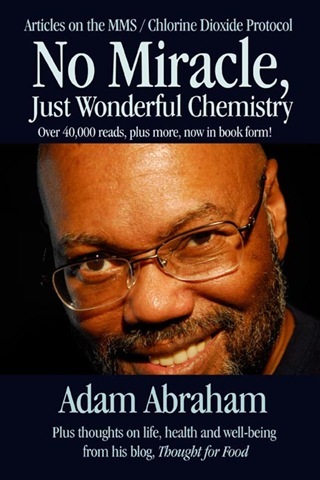 Your article “No miracle, just wonderful chemistry” is the first one I give to my friends, family, and contacts who want to use MMS. I’m dropping off a copy today to a person with Hep C.
It for the most part breaks the barrier that I wrote about before to you; “Watering the stick…” i.e. You can lead a horse to water, but you can’t make them drink. Suggest you do it as a e-book as well. And as this expands further welcome “approved” translations of the book. The faster this knowledge spreads, the faster more people can choose to get onto healing the planet. A comment on the “spindle dvds,” the dvds will still have the same silk-printed artwork as the retail version just without the plastic case and case artwork. It makes the mailing of this dvd much easier and less expensive especially in quantities. I encourage everyone to send Adam’s dvds to their family, friends and co-workers! And I hope that Adam will keep his book inexpensive in the $5.95 range so that it can be purchased by as many people as possible, e.g., in Wholefoods and other health and spiritual stores. Excellent work, looking forward to purchasing your book.